Clay Aiken – Are We There Yet? Monday, July 6, 2015…an exciting and fun day for those who follow Clay Aiken. Album credits are the lifeblood of musicians. Musicians need them to be displayed when their music is played. Showing the headline artist and track title only anonymizes and minimizes the contributions of all the others involved and forecloses opportunity. Please show the credits when music is played! Certainly sounds right to me! Just a few minutes after Clay sent the tweet, those who follow Clay on Periscope got a “whistle” to let us know that Clay was sending a Periscope to his followers. Clay was on the train from North Carolina to New York City! He was traveling with his son, Parker, and his friend Benji. The three were sharing a private room. 1. The train left NC two hours late…two hours to sit and wait(maybe sleep too). 2. Clay’s son loves trains and was excited to be on the train. 3. Clay read the screen and answered some of the comments and questions from his followers. 4. He mentioned that there was something new for the Gala…everyone who attends will go home with something special! 5. Clay was disappointed that they no longer have a dining car on the train…it’s an all-day trip!! 6. Clay introduced his friend Benji and had Parker say hi to those on Periscope. 7. Clay sang a few lines of a song, but didn’t want to disturb his neighbors on the train. 8. He said he would Periscope later in the day!! 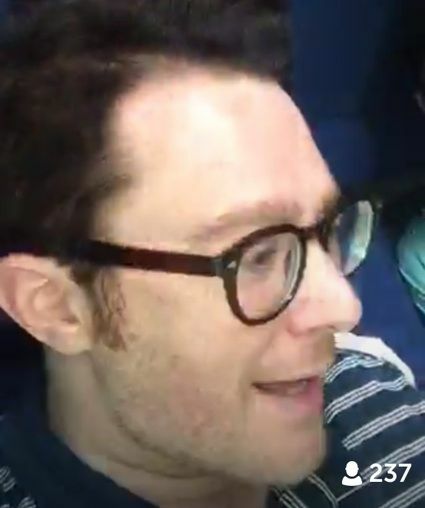 The wonderful Deemer made some screen caps of the morning Periscope. Many thanks!! Clay with his friend Benji. In the evening, Clay sent his followers another Periscope video. It was titled: Are We There Yet? 1. Clay said that they were supposed to be in NYC but had only made it to Philadelphia…they were still behind!! 2. Clay was anxious to get home to NYC. He was asked why he was going to NYC and he said, thats where he lives! 3. Clay asked Benji to explain about Yoga and obviously, Benji is an expert. 4. After answering some of the questions of his followers, all three of the guys sang a bit…the star…Parker, who sang the theme song from The Lego Movie… Seeing Clay’s proud look was enough to bring smiles to most people. A Big Thank You to Clay for sharing a bit of his time with his Periscope followers. These small visits make so many people happy and excited. I hope we get more again! Do you follow Clay on Periscope? Clay has 1,531 followers. Obviously, lots of fans are not signed up yet. After a day like today that was filled with so much fun, I hope Clay gets many more followers. It is free and easy to join. Twitter really likes Periscope. They purchased Periscope a few months ago for a reported 100 million dollars!! If you choose to sign up for Periscope, you can stream publicly or only share with a select group of friends and family. So…if you have trouble signing up for Periscope to follow Clay, please ask for help. There are lots of readers here who can help you out. I think it would be great to see some more followers of Clay Aiken.! Did you see the Periscope Videos of Clay on Monday?? 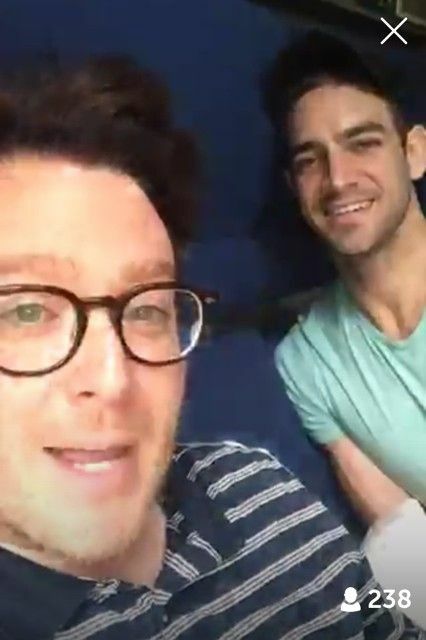 Absolutely loved this periscope time. Albeit, not in real time, as I wasn't sure what the chirp would sound like. I was doing dishes when I originally heard a chirp and didn't figure it out until later, silly me. That does it, I’m signing up!! I’m sorry I missed the fun. I've been dying for weeks now because my laptop and smart phone does not meet the specs required for downloading periscope app 🙁 So now I'm considering buying a new android phone just so I could follow Clay. I'm sure the broadcast from their train ride was great what with Parker now singing also. That must really be one proud moment for Daddy Clay… 🙂 Wish there was also clack for that… Thanks CANN!!! I love Clay's first line: we're still on this train! Parker seems happy and makes a lot of jokes! Very talkative and smart about trains! My favorite part is everyone singing the Lego movie song, Parker seems to have his daddy's gift of talking and singing! Thank you, Clay for sharing personal time with us! And thank you, musicfan for sharing! My heart is broken…I don't have any brand of smartphone. I still use just my desktop computer for keeping in touch. One of these days I guess I'll have to join the 21st century. So thanks to CANN for keeping me in touch with all things Clay. All three of those boys were adorable! Saw the first one at work and luckily we got the second one later as I never got his tweet!! Even Clay said there was some kind of error! Thanks Martha!! This was the best periscope ever!!! Loved seeing the "boys" on the train. Well…at least being able to hear Parker, and see his "name tag".. lol lol It really was cool. Error: Error validating access token: Session has expired on Tuesday, 21-Aug-18 16:13:01 PDT. The current time is Wednesday, 24-Apr-19 21:06:14 PDT.